Linn-Benton Community College (LBCC) was established in 1966 and is one of the largest community colleges in Oregon. Each year, more than 22,000 students take at least one class at the college. LBCC employs 449 staff and 481 faculty, and participates in a degree partnership program with nearby Oregon State University. 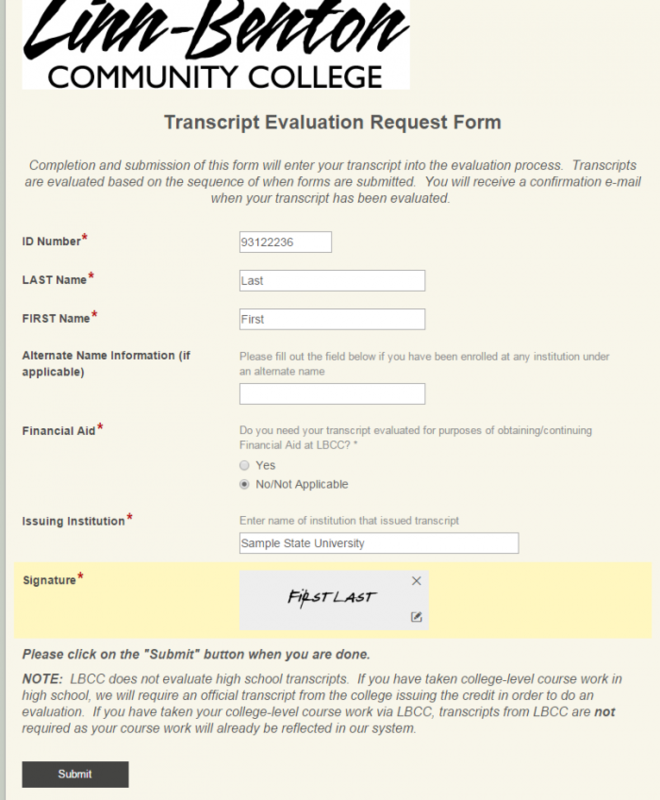 “The transcript evaluation process at LBCC was problematic for students and staff. It took an average of six to eight weeks to have a transcript evaluated, and our process organization and communication with students was lacking or non-existing,” said Amy Sikora, Assistant Director Enrollment Progression and Technology. “Laserfiche has been a great investment for our department. We used paper forms before, and had to decipher student handwriting, documentation would get lost, and the process was clunky at best. Now students can access the forms online, and they are routed through to appropriate staff for processing, and the student is notified though each step of the way,” added Sikora. “We are using Forms for many departmental processes such as student appeals, international student supplemental application materials and are actively working toward getting the whole college to use Laserfiche,” Sikora said. Here is how LBCC used Laserfiche to cut the time needed to evaluate transcripts from six to eight weeks down to only one week. The former process began when a student completed an online Transcript Evaluation Request form. Staff would move information from the form into a spreadsheet, and search in the Laserfiche repository for the corresponding transcript. If located, staff members would evaluate the transcript, and record the results in the spreadsheet. Then individual, generic emails were sent to students notifying them that their transcript had been evaluated. It took between six and eight weeks to evaluate one transcript. The previous transcript evaluation process was identified as a bottleneck to student success. Systems weren’t synchronized, which resulted in multiple points of data entry. In addition, students would at times request an evaluation when they hadn’t submitted a transcript and vice versa. Many did not know that they needed to complete a form to have a transcript evaluated. It was difficult to locate where a transcript was in the process, and students were not notified until the evaluation had been completed. This resulted in many calls and inquiries from students wanting to know if their transcript has been received and the status of the evaluation. In addition, records were changed repeatedly. If a request was received but the transcript was not, staff would have to recheck for the transcripts at a later date. Some requests were for transcripts from multiple institutions. In these cases, staff would often need to recheck the same evaluation request as transcripts would come in at different times (if at all). In these cases, requests would also need to be changed to indicate that the transcript from institution A was received and evaluated and needed a confirmation email, but the transcripts from institution B or C have not been received yet. Ultimately, staff spent as much time, if not more, in locating transcripts and documenting evaluation results as they did in the actual evaluation portion of the process. Data was not always completely secure because of the use of multiple products and multiple vendors. LBCC overcame all of those challenges by centralizing and automating the process with Laserfiche Forms and Workflow. Now, a transcript is scanned or imported into a New Transcripts folder in the Laserfiche repository when it arrives at LBCC. In the first folder, staff enters key pieces of metadata manually. Once the transcript metadata is saved, Laserfiche Workflow automatically moves it to the next folder, Banner Lookup. Next, staff search in the Banner student information system (SIS) to see if the transcript belongs to a student who has applied to LBCC. A transcript can only be evaluated if a student has applied to the college. 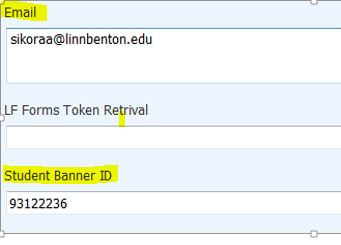 If there is no match found in Banner within 30 days, the transcript will be moved automatically into the Not a Student folder. If a match is found, staff will populate the student’s email and Student ID number into the corresponding metadata fields, which triggers Workflow to route the transcript to the Waiting for Eval Form Completion folder. Directing unmatched transcripts to the Not a Student folder after a specified period of time still allows staff to search for the transcript at a later date using the name fields in the metadata pane, while keeping the active folders uncluttered by aging unmatched records. Laserfiche Workflow sends an email notification to the student that confirms receipt of the transcript and includes a link to the Transcript Evaluation Request form in Laserfiche Forms. The student completes the form. If there are multiple transcripts, the student will be prompted to complete a form for each, which keeps the request form to transcript at a logical one-to-one ratio. The form is brief and easy to complete. 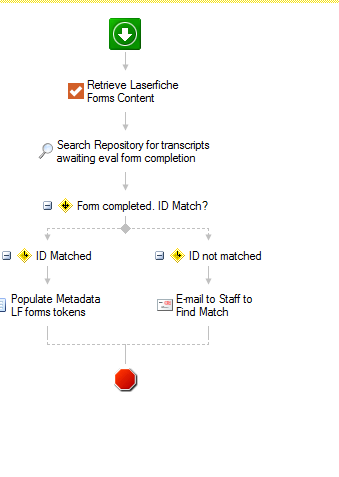 When the form is submitted, Laserfiche Workflow searches for the matching transcript in Laserfiche based on the Student ID. Workflow pulls data from the submitted form and uses it to rename the transcript according to a standardized naming convention, which is as follows: Student Last Name, Student First Name, Student ID, Transcript Institution. The transcript is then automatically moved to the Ready for Evaluation folder. If the student doesn’t complete the Transcript Evaluation Request form within 30 days, the transcript will move to the No Request folder. This allows staff to easily search for this transcript at a later date, using the fields in the metadata pane, while keeping the Ready for Evaluation folder manageable. Transcript evaluators look in the Ready for Evaluation folder to find unevaluated transcripts. Once an evaluation is complete, evaluators will select the appropriate status from the Evaluation Status drop-down field. A different email is sent to the student based on the evaluation status selected. These emails are customized to include the student’s name, the name of the institution and more details about what to expect from the evaluation. Once the evaluation status is selected, the transcript is automatically routed to the Evaluated Transcripts folder. Sometimes a transcript needs to move ahead in the evaluation queue, such as when a student has an upcoming New Student Center appointment and there is an unevaluated transcript in the process. If this happens, a workflow is invoked that searches for transcripts for these students in the Waiting for Eval Form Completion and Ready for Evaluation folders. If found, matched transcripts are moved to a priority folder, which then triggers an immediate email to evaluators, notifying them that there are transcripts that need special attention. Evaluators are notified by email of any transcripts that need immediate attention. Upon completion of these evaluations, the process then continues to route the transcript seamlessly through the rest of the workflow. The time needed to evaluate transcripts has decreased from six to eight weeks to only one week or less. Communication has vastly improved, with students remaining notified about the status of their transcript throughout the whole process. The process no longer involves disparate software and duplicate data entry. Data is secure and in no danger of being lost. Evaluators can easily manage their day-to-day workload since they have a clear view of all transcripts that need to be evaluated according to priority. Records are rarely processed manually and duplication of effort is minimized. Transcripts anywhere in the process are easy to locate and it is clear where they are and what the next steps in the process. Minimal time is spent on processes, and evaluators are free to use the bulk of their time for the task of evaluation.